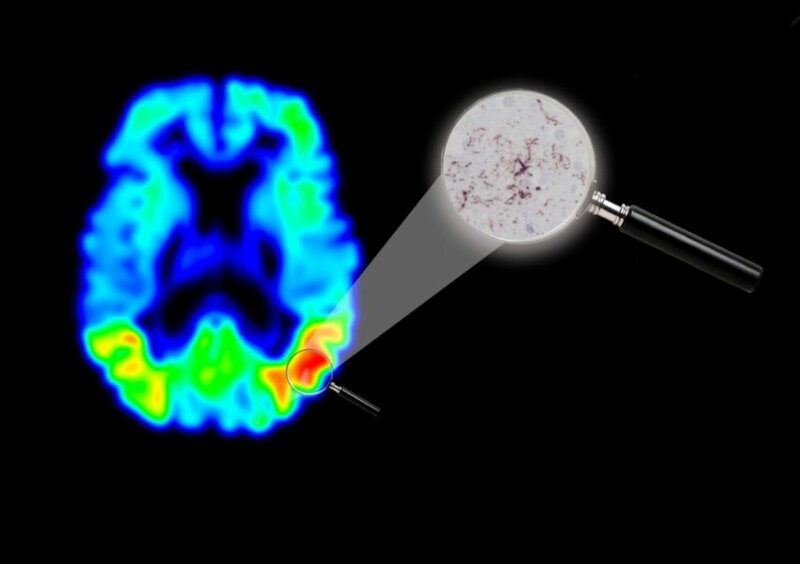 Tau PET is a new and promising imaging method for Alzheimer’s disease. A case study from Lund University in Sweden now confirms that tau PET images correspond to a higher degree to actual changes in the brain. According to the researchers behind the study, this increases opportunities for developing effective drugs. The brain of an Alzheimer’s patient in a tau PET image. Red indicates the areas with the highest concentration of the tau protein. In the magnifying glass, a microscope enlargement showing the dark red streaks and islands of tau. There are several different methods of producing images showing the changes in the brain associated with Alzheimer’s disease. The tau PET method reveals the presence of a protein in the brain, tau, with the help of a gamma camera and a specially selected radioactive molecule (F-AV-1451). Tau has an important function in assisting the transport of various substances within the brain’s nerve cells. People with Alzheimer’s disease have raised levels of tau, leading to accumulation of the protein in the brain cells and gradually to cell death. Lund University and Skåne University Hospital are among other institutions studying patients with the tau PET method for research purposes. Until now, no one has had precise knowledge of how well the new imaging method reproduces the actual changes in a brain affected by Alzheimer’s disease. The current case study, however, shows that image and reality match up well. The study has enabled researchers to compare tau PET images and brain tissue from the same person for the first time. The brain tissue came from a person who died having recently undergone examination with the new imaging method. “The person who was examined had a mutation which led to the same type of accumulation of tau in the brain as in Alzheimer’s disease. A single case study might seem insignificant, but since there are areas with a lot of tau stored and others with less tau in the same brain, it is sufficient to examine one person in order to verify whether the imaging method works,” explains Oskar Hansson, professor at Lund University and consultant at Skåne University Hospital. Interest from the research community in imaging methods focusing on tau is strong and growing. A reliable reproduction of tau protein in the brain is considered a more relevant marker and a better diagnostic tool than competing methods which are already in use. The researchers behind the study are now focusing on tracking aggregation of tau in the brain over time and connections with diagnostics using spinal fluid samples. Tau PET imaging is considered interesting for other, less common, neurological diseases as well, such as frontal lobe dementia and Parkinson’s-like diagnoses such as PSP (progressive supranuclear palsy) and CBD (corticobasal degeneration). The results are published in the journal Brain and the study was funded by the European Research Council (ERC), the Swedish Research Council, the Swedish Alzheimer’s Fund and the Swedish Brain Fund, among others.